When most people think of a dance competition kilts, bagpipes, and tradition are words that do not come to mind. But in the world of a competitive Highland Dancer, these things are the norm- along with the buns, makeup, and the inevitable “Dance Moms”. Highland Dancing is steeped in history, having originated in the Highlands of Scotland. The earliest information we have on Highland Dancing goes back to 1054 with the oldest of the dances: The Gillie Callum or the “Sword Dance”. The sword dance is exactly what it is named, the dancer must dance over a pair of crossed swords; they must not touch them for fear of disqualification in competition. History states that the sword dance was actually a ritual before war, where the soldiers would dance the sword dance and if they touched one of the swords they were likely to fall in battle (1). The next dance to be recorded is the Sheann Triubbhais (Shawn Troos), which is Gaelic for “Torn Trousers.” This dance originated during the 1745 Jacobite Uprising, which in very brief terms, was the movement to suppress Scottish Nationalism where it was forbidden to wear kilts. Many steps in this dance are very graceful, and one can see the underlying idea of kicking off one’s trousers (1). The Highland Fling is the staple of highland dance, this is the first dance one will learn. History does not give a specific date for when this dance originated, but it is assumed that it originated sometime within the 18th century. Legend states that this dance was originally performed on a shield, and when one watches this particular one executed, the legend actually makes a lot of sense because the steps are very rigid and precise focusing on dancing in one specific spot (1). When actually attending a Highland Dance competition, whether the patron is watching or competing, the main thing that stands out is the array of color. 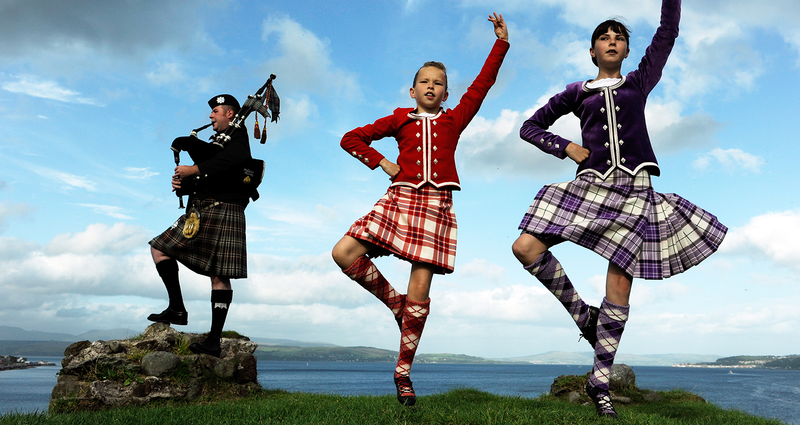 The tartans that highland dancers wear range from lime greens and hot pinks, to dark maroons and royal blues. Long ago, Scottish families had specific tartans to their names, so naturally a dancer, piper, or drummer had a kilt that stated their namesake. Today you will still see a dancer wearing either his or her family tartan, but more often than not, the kilts that are worn today are more chosen for their color and appearance. Kilts are not the only outfits that a Highland Dancer must have. They also have a whole arsenal of different outfits. These include white dresses with tartan sashes, Jig outfits, sailor costumes, and more. The four man outfits are, however: the Highland, the aboyne dress, the Jig outfit, and Sailor outfit. These all have specific requirements such as color, shape, etc. however, they are left up to a small bit of interpretation. There are so many dances and skills that a Highland Dancer must learn and know by heart for a competition, each one different and rooted in history and ritual. This is something that makes it truly individual and magnificent because these specific steps and dances have been passed down through generations over thousands of years. What once started as a ritual that men performed before war has grown into a beautiful array of colorful tartans, music, and bonding between talented lads and lassies.